NOTES: 2 in 1 Value Pack with figures. The Iosif Stalin tank (or IS tank, named after the Soviet leader Joseph Stalin), was a heavy tank developed by the Soviet Union during World War II. 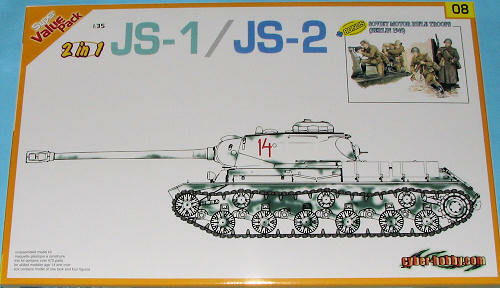 The tanks in the series are also sometimes called JS or ИС tanks. The heavy tank was designed with thick armour to counter the German 88 mm guns, and sported a main gun that was capable of defeating the German Tiger and Panther tanks. It was mainly a breakthrough tank, firing a heavy high-explosive shell that was useful against entrenchments and bunkers. The IS-2 was put into service in April 1944, and was used as a spearhead in the Battle for Berlin by the Red Army in the final stage of the war. The later IS-3 saw extensive use and was used by the Egyptians in the 1967 war with Israel. Though earlier IS-2 tanks were available with Chinese units in 1950, none saw action in Korea. As many of you might have guessed, these Value Pack kits are pretty much older kits with upgrades and extras. In this case, the upgrade is a newly molded lower hull. The kit has the different barrels for the JS-1 or the JS-2, but the rest of it is pretty much the same as when it was initially produced. Now that is not a bad thing as the Dragon kit was and still is very nicely done. This kit also has the Magic Track individual link track system to add that much more realism to the kit. 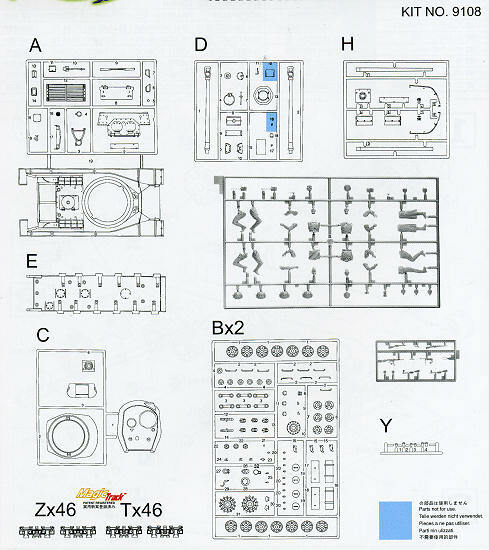 It accounts for many of the 470 parts in this kit and with such a relatively low parts count, construction of this one will not take as long as some others. The kit also includes four Soviet riflemen figures. It is set 6019 from their Berlin 1945 selection so fits in well with the time frame in which these tanks were use. The kit instructions are well done and provide clearly marked sections for the difference between the two types. You have the option of three sets of markings. Well, two as one has no decals. There are two JS-2s, an overall white washed version marked Red 14 at Vitebsk in 1944. 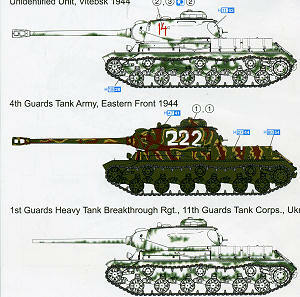 White 222 has a distinctly German looking variegated scheme of brown, tan and green from the 4 Guards Tank Army in 1944. The unmarked JS-1 is from the 1st Guards Heavy Tank Breakthrough Rgt in Ukraine 1944. It is also in a winter wash. 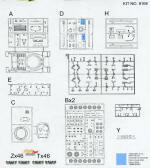 The instructions are in color and include the assembly and painting guide for the figures. Some of you may have noticed that there is no photo-etch in this kit, something a bit unusual for Dragon/Cyber-Hobby. If you missed out on either of these tanks when first issued, now you have a chance to get it again, and this time with the nice Magic Tracks and extra figures at a most reasonable price. Thanks to www.dragonmodelsusa.com for the preview copy. Get yours today at your local shop or on-line retailer.